Atlantic City’s Nucky Thompson is a very happy man. HBO has renewed Boardwalk Empire for a fourth season. There’s no word on when the new episodes will air or how many have been ordered but each of the existing seasons have had a dozen installments each and have kicked off in September. The third season debuted a few weeks ago, on September 16th, and is expected to finish airing on December 2nd. LOS ANGELES, Oct. 2, 2012 – Following the hit series’ third-season debut on Sept. 16, HBO has renewed BOARDWALK EMPIRE for a fourth season, it was announced today by Michael Lombardo, president, HBO Programming. From Terence Winter, Emmy(R)-winning writer of “The Sopranos” and Academy Award(R)-winning director Martin Scorsese, BOARDWALK EMPIRE is set in the 1920s during Prohibition, and chronicles the life and times of Enoch “Nucky” Thompson, the undisputed leader of Atlantic City. Last season, BOARDWALK EMPIRE averaged 8.6 million viewers an episode. To date, the first episode of the current season has already gathered 7.2 million viewers and will continue to grow via additional telecasts, DVR playback and HBO On Demand and HBO GO. BOARDWALK EMPIRE recently received four 2012 Emmy(R) Awards, for Outstanding Directing for a Drama Series (Tim Van Patten); Outstanding Art Direction for a Single-Camera Series (tie with “Game of Thrones”); Outstanding Cinematography for a Single-Camera Series; and Outstanding Special Visual Effects in a Supporting Role. At the 2011 Primetime Emmy(R) Awards, the series led all programming with eight awards, including Outstanding Directing for a Drama Series (Martin Scorsese). In Jan. 2011, BOARDWALK EMPIRE received two Golden Globe Awards, for Best Television Series – Drama and Best Performance by an Actor in a Television Series – Drama (Steve Buscemi). Season three credits: Created by Terence Winter, BOARDWALK EMPIRE is executive produced by Terence Winter, Martin Scorsese, Mark Wahlberg, Stephen Levinson, Tim Van Patten and Howard Korder; co-executive producers, Eugene Kelly, Chris Haddock, Andrew Schneider, Diane Frolov, Rolin Jones; producers, Joseph Iberti, Rick Yorn; co-producer, Steve Kornacki; supervising producer, David Stenn. What do you think? Dou like Boardwalk Empire on HBO? Are you glad to hear that it’s been renewed? Boardwalk Empire: HBO TV Show Renewed for Season Two Already! VERY good show… well acted and great themes. keep it up!! Them one week and then they are gone. 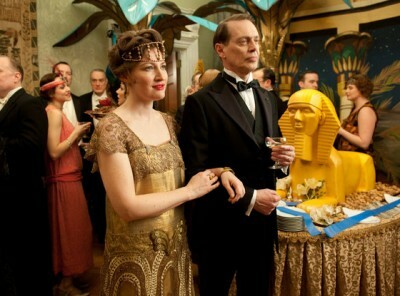 But all the actors are excellent in this series, especially Nucky. I have several thoughts…yes..I am glad it’s renewed, but this entire season, through episode eight, in my opinion, hasn’t had enough central focus, …too many people, …too many tangents here and there, with not enough time devoted to any one idea, ..(as a result, some actors are rarely seen for weeks at a time) ….and overall seems to be wandering at a snails pace, …with a lot less punch than last year. I agree with you 100%, since the 1st episode this show has just limped along. Yay! Everyone’s happy to hear Boardwalk will be back again next season.